Discussion in 'Mapping Questions & Discussion' started by A Boojum Snark, Jul 10, 2014. I poked around at the things today and thought I'd make a thread for what I've found. I wouldn't try making anything with them yet, because I assume they are very open to changing since it is a beta game mode. The logic/hud supports any number of beepbot groups, from none up to 9 and probably more. I didn't try more because the hud reached the edge of my screen. You can specify the hud icon to use, but that is only the "bot" picture. The lock and team color are hard coded. You can also have a different amount of groups for each team, including having them only for one team. The flag/stealing mechanic is not required, you can have RD without it. I have not tried but I am guessing you could also have this be one-sided. You can specify how many cores a bot drops on death, as well as the health of the bot. The cores are item_bonuspack, and can be manually spawned and collected (must set team/skin properly). Bots require a nav mesh to function (hence why they don't follow the path exactly) and seem to have a hard coded speed, but they do respect path_track branching. The main logic entity has some other settings I've yet to figure out, which may or may not work, given the beta state. All in all, I am very pleased with the apparent flexibility of the entities and look forward to making something weird when RD is officially released. Don't forget the part about the game winning not being automated. Oh yeah, on reaching the max score (customizable), an output will be fired. So you can make the game end however/whenever you want. Or not at all. PLRD? KOTR? 5CPRD? All of them at once? Not that I could tell. Skins didn't seem to indicate support either: 0 red, 1 blue, 2 red uber, 3 blue uber. I'm not so much interested in them as a gameplay element currently for any of my maps. But more so as a dynamic element to make the map feel more alive. Does this mean you can just have the two score-counting HUD elements, manually spawn item_bonuspacks, and not have any of the robot stuff? Is the core mechanic hardcoded, or can mappers in-/decrease team points via entities? how does the setup with the flag work? I can pick it up in my map but it never steals any points. Well, does the opposing team have any points for you to steal? There is a reason why the flag is disabled in asteroid. or can mappers in-/decrease team points via entities? No, but I imagine that wouldn't be a big request to make now that the rest of the stuff is here. I didn't actually set it up yet, but do you have all the triggers? I noticed that Asteroid had about four, including a new one. Just want to point out TC is totally workable now. With the trigger_player_respawn_override and a team filter you can put one around a point and allow the team that's sucessfully pushing through to respawn faster than the team that's turtling around their own point. Die by your own point -> long respawn, die by the other team's point -> instant spawn. 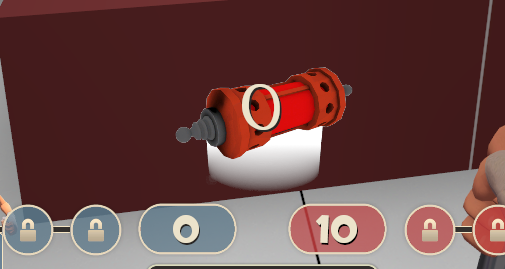 Put in a little setup time to avoid scout insta caps and allow engies to set up a little and now you totally have a 2CP environment that will swing towards the better team. It has other uses too. Want RED to respawn quickly after an A/D point is capped? Put a big brush around the whole stage and only activate it for 5 seconds after the cap is won, any straggling red players killed in those 5 seconds will respawn quickly along with those who died before the cap. Want to encourage players trying to cap? Put one on the capture point area so any player killed while trying to cap gets their respawn time slashed. All the other ideas sound great, but do you have a way to communicate this to the player? I don't see it working if people don't know. Anyone care to guess what Valve intends with the unused robot model? It has a wheel at the bottom, making it look intended to move more than the used bots. It could be tied to the unused paths between the robot zones. Boojum, what keys are there for item_bonuspack? Think you could put that on the developer wiki?